Don’t let gluten-free baking intimidate you! 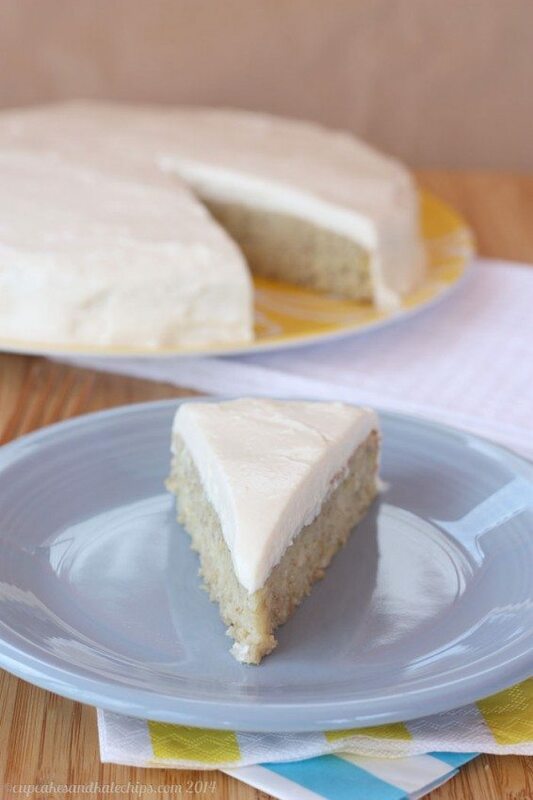 Topped with an optional Greek yogurt cream cheese frosting, this cake is made without a ton of sugar and no wheat flour, and no special ingredients, but is still super moist and sweet from your kids favorite fruit. 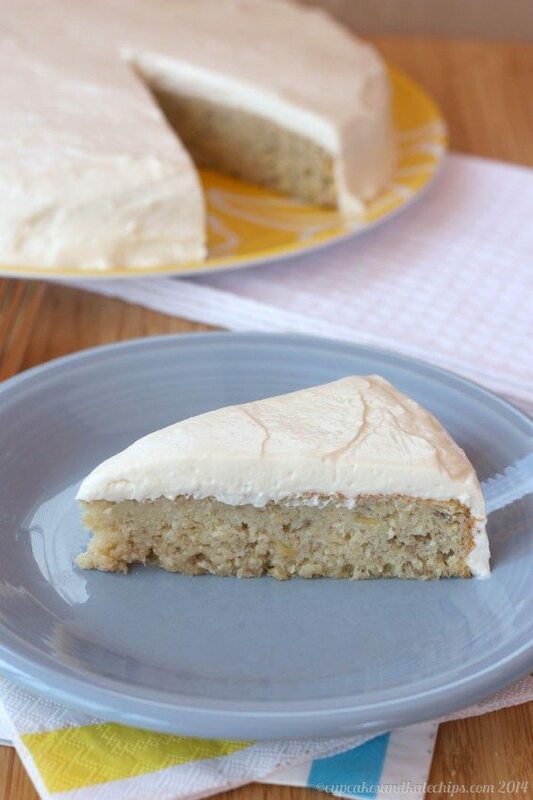 For a special after-school snack or healthier treat, try this Gluten-Free Banana Snack Cake. In my time here as a contributor at The NY Melrose Family, I’ve tried to give you a variety of healthy snack ideas for you and your kids, and as I’ve come up with recipes, I’ve tried to think about different concerns of parents due to food allergies. Obviously we want all kids to be safe and healthy, so nowadays when we have playdates or parties, we all have to consider t these things, whether some member of our own family has an allergy or not. So while nuts and peanut butter are not a concern for my family, I, myself have a wheat allergy. So you may notice that most of the recipes I’ve shared here and most of what I post on Cupcakes & Kale Chips are what I call “naturally gluten free”, meaning that while they don’t have a big “GLUTEN-FREE” label – they just are gluten0free. I prefer not to go buy any special ingredients, and just use things like fruit, vegetables, rice, quinoa, yogurt, proteins. But sometimes, I want cake! But even being mostly wheat-free, I still get a little nervous about gluten-free baking. The ratios, the expensive ingredients, the potential for funny flavors. I tiptoed into it with these secret ingredient Coconut Salted Caramel Chocolate Cupcakes, but that kinda felt like cheating. I went small batch with gluten-free Deep Dish Hot Fudge Brownies, Deep Dish Chocolate Chip Cookies and Deep Dish Carrot Cakes that only serve two apiece, so I wouldn’t waste a lot with any potential failures, and luckily had great success. But sometimes you gotta feed more than two people. So I got really adventurous and take on a serious fancy pants dessert with this Gluten-Free Golden Fudge Cake, but that feeds an army! So let’s be more specific. Sometimes I want a cake not just for me, and not for a party of twelve, but just for my little family of four, and maybe a couple of guests, or a few slices leftover. But that doesn’t mean I want to go buy a special gluten free cake mix or flour blend, or a million different ingredients. That’s where Gluten-Free Banana Snack Cake comes in. About the ingredients, I do try to stay away from gluten-free flour blends because they aren’t all created equal, and I want my recipes to be universal. Sure you can buy oat flows, but I just grind oatmeal into a powder in my blender or food processor – just make sure they are certified gluten-free if you are baking for someone with celiac or a serious sensitivity (same think with the baking powder). Almond meal is readily available in most grocery stores these days, as is tapioca starch, though I have heard from others that you can usually get equivalent results in more recipes by using potato starch or sometimes even corn starch. And why do I call this a “snack cake”? Well, first of all, it’s a single layer, easy for serving some small snack-size pieces. Plus, due to the oats and almond meal, the flavor and texture is not exactly that of “cake cake”. It’s got a heartier, less delicate taste and crumb, and the bananas do give it a lot of natural sweetness and moisture. It’s more along the lines of banana bread, but cake just sounds more fun. Especially when you top it with my not-overly-sweet, protein-packed Greek yogurt cream cheese frosting. Plus, since it’s low in added sugar, filled with whole grains from the oat flour, and protein and healthy fats from the almond flour, it’s totally a cake that is worthy of snack status, and doesn’t just have to be reserved for a special occasion dessert. 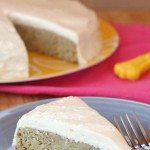 I hope you’ll give this Gluten-Free Banana Snack Cake a try, and conquer any fears of gluten-free baking! 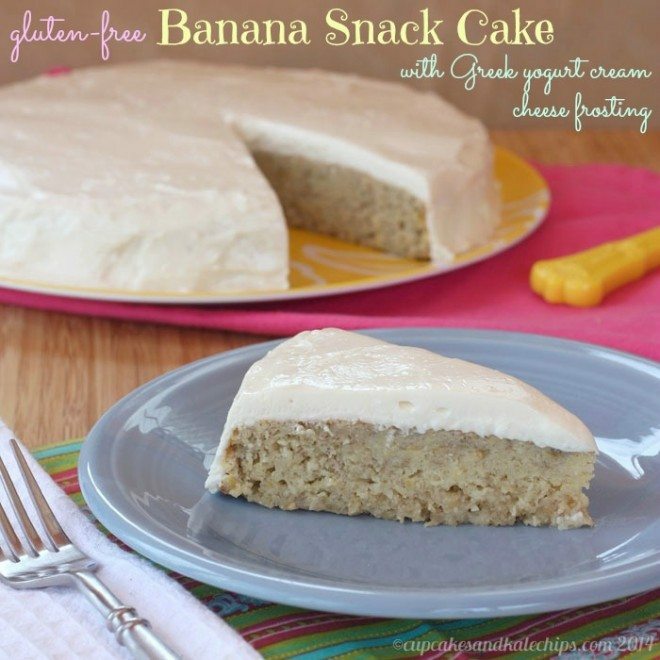 For a special after-school snack or healthier treat, try this Gluten-Free Banana Snack Cake. Preheat oven to 350°F. Spray a 9-inch cake pan with cooking spray or mist with oil, and line the bottom with parchment paper. In a large bowl, whisk together the almond meal, oat flour, tapioca starch, sugar, baking powder, and salt until thoroughly combined. In a medium bowl, whisk together the eggs, oil, and milk. Add the wet ingredients to the dry ingredients and fold gently to combine. Stir in the mashed bananas. Pour the batter into the prepared pan and bake for 30-35 minutes, or until slightly browned and firm to the touch. Note: Oat flour was made by grinding oats in a food processor or blender until a powder. If any large pieces remain, they can be sifted out. Looks really good! Would coconut oil work? … in lieu of the vegetable oil? I regularly use coconut oil or butter in recipes that call for vegetable oil and have only had success.